Sweet summertime… When I was growing up, that meant spending time outside from sun up to sun down! I mean, my mom literally kicked us out of the house during the day because I am sure me and my three other siblings were driving her nuts… But regardless, we truly loved our carefree summers spent under the sun and in the fresh air! In the current time, I feel that it is not as common to see kids outside ALL. DAY. LONG and maybe it’s for various reasons. Whatever the reason for why children are not getting outside, I feel that children learn best when they can explore their environment. Natural environment teaching is when a child learns in the ‘real world’. They are able to see actual examples of the concepts that they are learning which further reinforces the learning strategy. Anytime you can get your child ‘out and about’ when learning a new concept, the better! You provide a bag to your cutie and tell them that they are to find items in nature that correspond to the color on the bag. Rule– The items MUST be found outside. 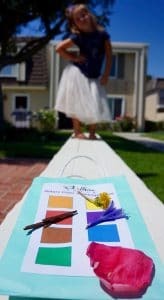 Provide a pen/marker to mark off colors as they explore. This works on fine motor development and writing skills. Older kids, you could provide the expectation that they must write the color for it to count (i.e. if they found a pink flower, they had to write ‘pink’ in the square). Winner– You could set up a contingency that the winner of the game gets to pick out the movie for family movie night or a family activity (game night?) that evening. If your child is becoming interested in a particular color, try finding other items of that color and start counting how many “purple” items you can find. 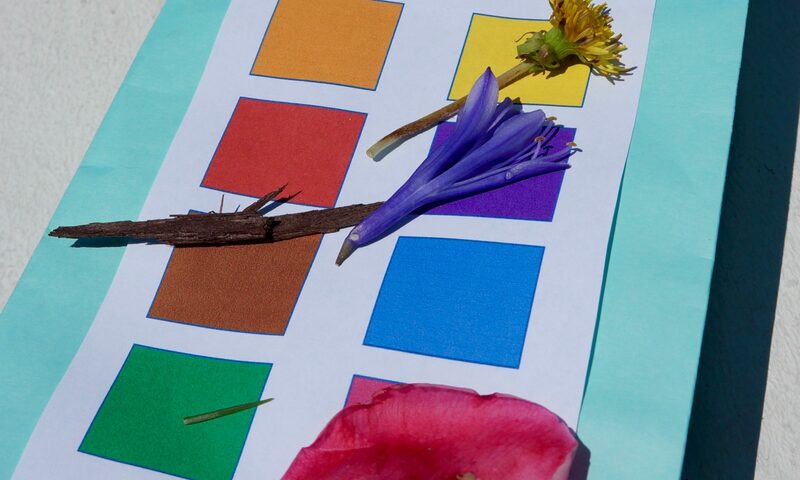 Find learning opportunities- If your child only found flowers on their nature hunt because that seems to be the most colorful thing in your yard; Talk about that! My daughter had trouble finding blue so we improvised and ‘grabbed the blue sky’. Then we talked about other ‘blue’ things in nature like the ocean and the pool water but talked about why that couldn’t go in our bag. This helped to expand her expressive language and critical thinking! Enjoy this as a family! I used a gift bag so my daughter had a handle while on her nature hunt however, any bag will do! 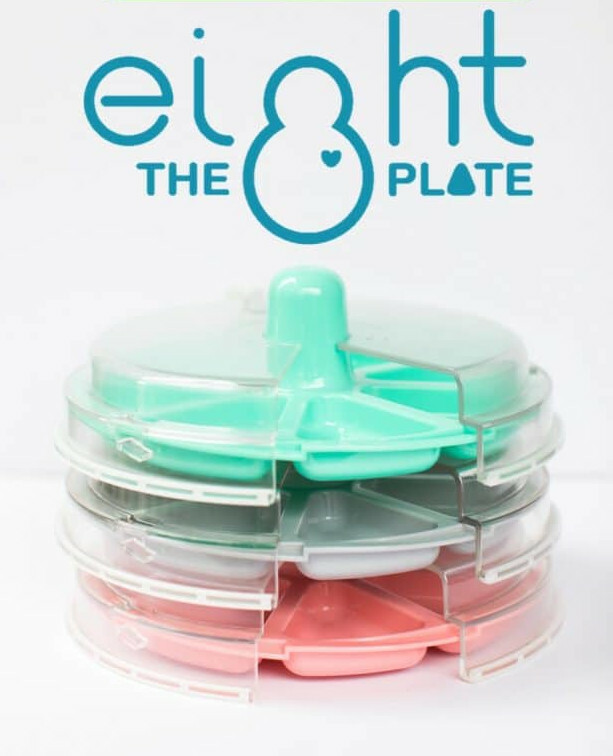 You can use any color marking to represent the colors that are needed for your babe to find in nature! Place that on the outside of the bag. 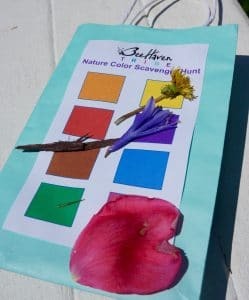 If you would like a copy of my ‘BeeHaven Tribe Nature Color Scavenger Hunt’ Document, Contact Me HERE and I will message you the pdf version. If you have the pdf version, cut then either cut/glue onto the bag and then tell your child to go hunt!